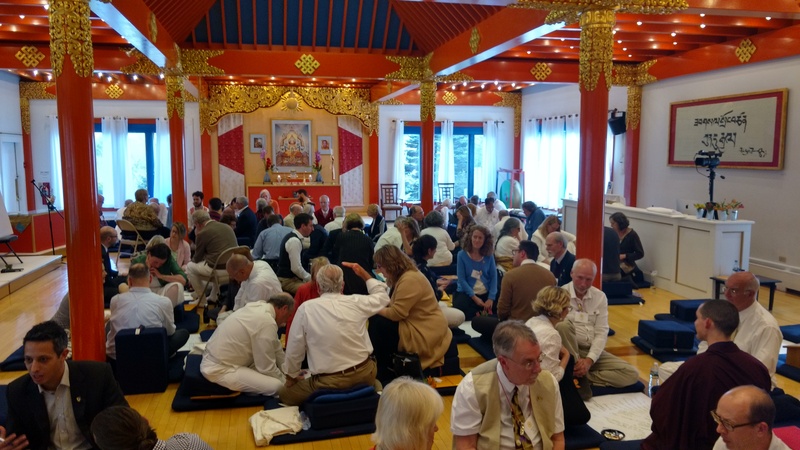 This May, leaders from throughout the Shambhala community gathered with the Kongma Sakyong, among the blossoms of Karme Choling, for the first Kalapa Garchen (Great Gathering.) The Sakyong was overjoyed to have this opportunity to teach to leaders from around the world representing all Four Pillars of Shambhala. As the retreat had to be organized swiftly, a relatively small number of leaders could be accommodated, but the Sakyong made it clear this was to be the first of many more — and likely much larger — gatherings. The Sakyong, to his and the leadership’s great delight, made offerings of teachings directed to all leaders, pointing out again and again the power of developing our strong allegiance to basic goodness. As well, he specifically directed teachings to enrich each of the Four Pillars of Practice and Education, Economy, Government, and Protection, with the clear understanding that many more teachings will follow, with clear paths of training emerging in the coming years. The ongoing theme of the gathering was The Richness of Shambhala. This was manifest in so many ways, in and out of the shrine room, through lhasangs, group practice, question and answer sessions, flower arranging, study periods, feasting and Kasung drill, as well as unscheduled time allowing for individual connections, conversations, social time and celebrations including a theatrical premier. Through the skillful leadership of trained facilitators, open conversations arouse around what individuals were really passionate to talk about, their challenging issues and inspirations – all within a protected, honest and open environment. Born in Hawaii, and raised in San Diego, Jane Arthur has degrees in nursing and law – having paid her way through law school. For 15 years her nursing career was working in pediatrics, primarily neonatal intensive care. Jane was a Captain in the US Air Force Nurse Corps, where she was awarded the Meritorious Service Award. Her law career included being a Public Defender in Virginia and an Assistant Attorney General in the Northern Mariana Islands in the Pacific Ocean. 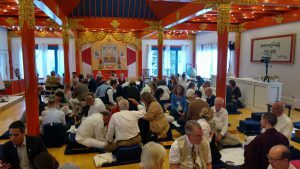 Jane connected with Shambhala at a dathun at Karme Choling in 1997, and that year became a staff member, initially serving by answering the telephone and later as Program Sphere Manager. At the Sakyong’s request, Jane was Director of the Boulder Shambhala Center 2000-2004, the Chair of the Marpa House Board and a member of the Sakyong’s Council. She completed Naropa University’s Authentic Leadership program, coordinated the first Rigden Abhisheka in 2005 with 800 participants, and moved to Shambhala Mountain Center as the Director of Practice and Education. 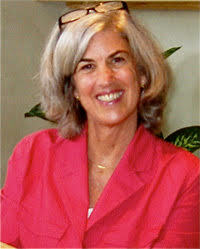 Jane was appointed as the Director of Karme Choling in 2006 and stayed until 2014, when she became the Director of Residential and Retreat Centers. A graduate of the Vermont Leadership Institute Class of 2012, Jane directed the Institute from 2014-2016. She was appointed as Kalapa Envoy for Leadership and Mentorship and joined the Kalapa Council in 2015. Jane lives in Danville, Vermont near Karme Choling with her sweetheart, John McClung, and two cats where she remains active in her local community ,being a member of the local hospital board and Rotary Club. Robert Reichner was born in Illinois, graduating from Reed College in Portland, OR with a BA in English. He moved to Prague, Czech Republic where he taught English and started his first business, a language services company. Settling in Seattle, where he lives today, Robert worked in a non-profit finance organization managing grants for a health, research and education. 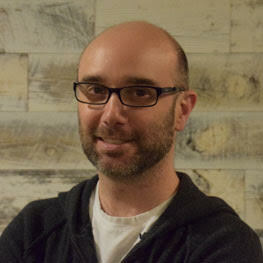 In 2001 he connected with Shambhala in Seattle where he served the Center as Director of Finance 2002-2005, as Co-Director 2005-2007, and as Board Chair from 2007-2013. He attended Vajrayana Seminary in 2005. In 2007 Robert started Offbeat Creations, Inc. which was later acquired and eventually became part of Disney with Robert running one of their Seattle studios. He launched http://www.repairshopr.com/ as CEO, to serve reuse and repair businesses around the world and opened Visette Boutique in 2015 to offer the Seattle community a home for finding dresses to uplift and rouse oneself by wearing good clothes. Robert was appointed Kalapa Envoy for Enrichment in 2013, soon joined the Kalapa Council and was appointed Leader of the Pillar of Economy in 2015. He is a member of the Ziji Council of Stewards and the Board of the Shambhala Credit Union (formerly Ashoka Credit Union). thank you for sharing. great to learn!